Lisa Labute is the creator and chef of the Goods. She believes food is a powerful tool for betterment. After experiencing its power to affect change in her own life she started the Goods. She wants people to remember what real food looks like and tastes like and ultimately what it feels like. 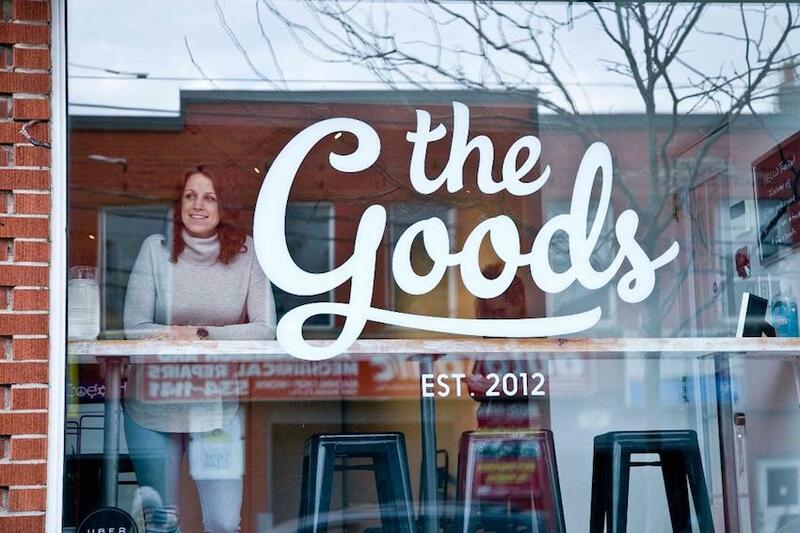 The Goods has been located in the West End of Toronto since 2012, they offer catering, delivery, and takeout with a few window seats for eating in. Their entire menu is plant-based and made from scratch, using functional ingredients. The Goods was ranked one of the 10 healthiest Restaurants in Toronto, which is definitely more reason to go check it out! When did you start the Goods? I started the Goods in 2012, I was committed into being part of the healing food movement and spent the better part of the year blogging, coaching, teaching, and studying before I found myself preparing lunches for delivery around town. I had a healing experience, unexpectedly, after changing my eating habits from a pretty standard Western diet to a primarily plant-based diet. The transformation on every level, mind, body, and spirit, was profound. I was so blown away by the overall improvement in my health that I quit my career in advertising and dove into the functional food world headfirst. What are some tips you can give for eating healthy while living a busy lifestyle? My number one tip for eating healthy is buying a good blender and make green smoothies! They’re a staple for me and guarantee I get my daily dose of greens, fruits, veggies and good fats. A few additional suggestions for eating well when you’re in a pinch; the takeout scene in Toronto has really improved over the last few years, you can always grab takeout or delivery from us, or there are loads of other spots in the city offering healthy alternatives to traditional junky takeout. Alternatively, if you want to start cooking at home, but don’t know where to start, ordering meal prep kits can give you a real boost of confidence in the kitchen and form some great new habits. I like Hello Fresh the best, their veggie box is pretty great. What’s your favourite item on the Goods menu? Everything is my favourite, otherwise, I wouldn’t put them on my menu 🙂 but if you’re making me select one item then it’s my Be Well Soup. It’s a medicinal-superfood broth with turmeric, garlic, ginger, miso, and chaga. We load it with immunity-boosting shiitake, portobello and cremini mushrooms, carrot, celery, red onion and brown rice. It’s very comforting and a bit nostalgic reminds me of homemade chicken and rice soup from when I was a kid. What’s something your customers may not know about the Goods? We don’t have any can openers in our store. That means everything we make starts with single ingredients, the ultimate from scratch menu. And since everything is plant-based and we’re committed to keeping everything as fresh as possible, it’s tremendously healing food. What do enjoy most about working at one of Toronto’s favourite healthiest restaurants? The people always! I feel like I hit the jackpot when it comes to customers, everyone is so unbelievably supportive and enthusiastic about what we do. And nothing makes me happier than to help someone feel good through the food we craft.